In keeping with the theme of "all things past", each of the thirteen tracks on the album are named after an ancient or long-standing city. E.S. Posthumus is an independent music group that produces cinematic style music. It is a form of epic classical that fuses intertwined drum beats with orchestral and electronic sounds. Their music is inspired by the Pythagorean Philosophy which states that "music is the harmonization of opposites; the conciliation of warring elements". The E.S. 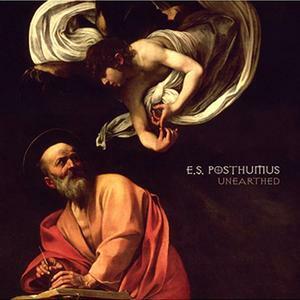 is an acronym for "Experimental Sounds" while Posthumus is a word that represents "all things past". E. S. Posthumus has been making subtle waves within the realm of film music- specifically in movie trailers. Their first ripple came with the inclusion of their music in the Planet of the Apes trailers in 2001. Also, a selection was used in the intriguing teaser trailer for the Steven Spielberg film, Minority Report. Most recently, in one of the most downloaded trailers on the internet, the Spider-Man trailer features a power-packed selection from the E.S. Posthumus' Unearthed. The use of E.S. Posthumus' work in such high-profile trailers is definitely high praise and strong indication that its evocative nature will be appealing to many film score fans. Throughout Unearthed, one will easily hear similarities to some of the most popular scores in the last ten years, while never being in danger of truly "ripping" off any single composer. To create their "sound," E.S. Posthumus employs a variety of synthesizers, loops and samples. The combination itself will draw comparisons to Media Ventures, and there are a few thin similarities, but E.S. Posthumus creates a musical environment closer to the work of composer Craig Armstrong (Plunkett & MacLeane, Moulin Rouge, Kiss of the Dragon) than any of the Zimmerites. Still, fans of Hans Zimmer's Gladiator will certainly enjoy tracks such as Antissa (1), Tikal (2), and Menouthis (10) - as the forceful vocals and Middle-Eastern flavor will bring back visions of the Roman deathmatches. Craig Armstrong's Plunkett and Macleane has seen its fair share of film trailers and tracks such as Ebla (5) , Nineveh (8) and Pompeii (12) exude the same power and thematic bliss as Armstrong's well-utilized work. On the lighter side, Unearthed contains a few pieces that come closer to jazz-new-age-fusion. Despite their relaxed posture tracks such as Ulaid (4) and Cuzco (7) are no less entertaining and help to round out the overall listening experience very well. Both feature a Celtic-thread, Ulaid (4) in particular. Other peace-inducing tracks include Nara (6), and Estremoz (11) - with its lead guitars and gorgeous female chorus. Its the closest thing to a love-theme on the album. Despite not being a true "soundtrack," Unearthed satisfies like the best of them. Not being constrained by film sequences, directors or producers, E.S. Posthumus is able to deliver high-quality, emotional music which seems to underscore a story we simply haven't been privy to - which is what makes it perfect for use in big budget movie trailers. Despite its electronic and synthesized foundation, Unearthed maintains a strong "organic" feel throughout every track. The various acoustic percussions, guitars and woodwinds layered above the electronic foundation keeps the music approachable…and in the end, more enjoyable than the typical electro-score. От себя могу сказать, что музыка просто великолепна. Она действительно киниматографична, подойдет для любого фильма. Собственно, многие из вас ее уже не раз слышали - в трейлерах многих голливудских блокбастеров. Ее можно сравнить с некоторыми коллективами, пишущими музыку с использованием григорианского пения, такими как Enigma, E Nomine, Era. Но при этом музыка более симфоничная, пафосная. С другой стороны, она более электронная и разноплановая, некоторые композиции выполнены в других стилях и жанрах - но в общем, этот альбом доставит вам много приятных минут, и, я уверен, даже вдохновит на повторное прослушивание.